Objectives Changing terminology for low-risk, screen-detected conditions has now been recommended by several expert groups in order to prevent overdiagnosis and reduce the associated harms of overtreatment. However, the effect of terminology on patients’ preferences for management is not well understood. This review aims to synthesise existing studies on terminology and its impact on management decision making. Methods Studies were included that compared two or more terminologies to describe the same condition and measured the effect on treatment or management preferences and/or choices. Studies were identified via database searches from inception to April 2017, and from reference lists. Two authors evaluated the eligibility of studies with verification from the study team, extracted and crosschecked data, and assessed the risk of bias of included studies. Results Of the 1399 titles identified, seven studies, all of which included hypothetical scenarios, met the inclusion criteria. Six studies were quantitative and one was qualitative. Six of the studies were of high quality. Studies covered a diverse range of conditions: ductal carcinoma in situ (3), gastro-oesophageal reflux disease (1), conjunctivitis (1), polycystic ovary syndrome (1) and a bony fracture (1). The terminologies compared in each study varied based on the condition assessed. Based on a narrative synthesis of the data, when a more medicalised or precise term was used to describe the condition, it generally resulted in a shift in preference towards more invasive managements, and/or higher ratings of anxiety and perceived severity of the condition. Conclusions Different terminology given for the same condition influenced management preferences and psychological outcomes in a consistent pattern in these studies. Changing the terminology may be one strategy to reduce patient preferences for aggressive management responses to low-risk conditions. Trial registration number PROSPERO: CRD42016035643. This is the first systematic review to synthesise the evidence on how different terminology given for the same condition impacts patients’ management preferences. Only a small number of studies have examined this research question and were included in the review. Due to the variability of terms and outcomes assessed, authors were unable to conduct a meta-analysis and pool the effects of the data. All studies included were hypothetical; therefore patients facing a real diagnosis may respond differently. Medical encounters can be challenging and confronting for patients, especially when they are faced with a management decision. Clinical communication and language is an important aspect of a medical encounter as it influences patients’ understanding of their diagnosis and management options.1 2 Decisions about treatments or tests may be influenced by various communication factors including the medical terminology clinicians use to diagnose and describe conditions to patients. Overdiagnosis of several medical conditions and associated overtreatment is now widely accepted3 4 and can have serious implications for patients, healthcare systems and society.5 6 Numerous approaches are beginning to be proposed to help combat overdiagnosis and overtreatment, including various communication strategies.7 Changing the terminology for medical conditions may be one communication strategy to mitigate the effect of overdiagnosis and overtreatment as it has the potential to influence the effect of diagnosis and labelling of a condition, and influence patients’ decision making about management. It may encourage both patients and clinicians to more carefully consider conservative management options. In particular, cancer terminology is one area where use of different terminology may greatly influence management decision making. The term ‘cancer’ is understandably frightening for people to hear and can influence their thought and action,8 but it is now well accepted by cancer experts, researchers and clinicians that a range of conditions which include indolent to fast-growing lesions are labelled as cancer.9 Lesions with low malignant potential are common (such as low-risk ductal carcinoma in situ (DCIS), low-risk papillary thyroid cancer and low-grade prostate cancer), and with the advent and increasing use of various screening technologies, these indolent lesions and their precursors are now frequently clinically identified. This identification can lead to the condition being overdiagnosed and in turn overtreated. Changing the terminology for these low-risk, screen-detected conditions has now been recommended by several expert groups—including a National Institutes of Health state-of-the-science conference panel and a National Cancer Institute working group—in order to prevent overdiagnosis and encourage more consideration of less invasive management options such as active surveillance.9–11 However, the effect of terminology on patients’ willingness to accept more conservative management options is not well understood. This systematic review aims to synthesise existing studies on terminology for medical conditions and its impact on management decision making, and associated psychosocial outcomes. The review’s protocol is registered with PROSPERO (an international prospective register of systematic reviews), registration number: CRD42016035643. How do different terminologies given to the same condition influence treatment or management decision making? A comprehensive list of search terms was developed (see online supplementary appendix 1) with consultation from an information specialist and a search of relevant databases (Medline, Pre-Medline, EMBASE, PyscINFO, Cinhal and PubMed) was conducted from inception to April 2017. 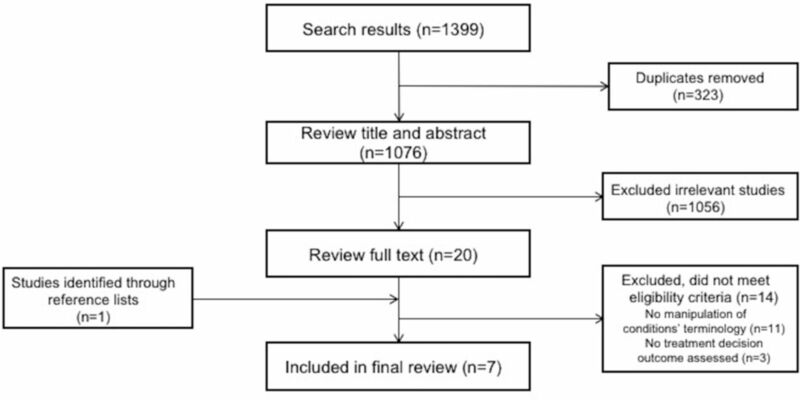 The returned search results were screened by title and abstract independently by two researchers (BN and TC) for irrelevant articles, review papers, editorials or commentaries and duplicates. An eligibility checklist was developed (see online supplementary appendix 2) to guide the selection of appropriate studies. Decisions regarding inclusion and exclusion of studies were then made independently by two researchers (BN and TC) and disagreements discussed. Any further disagreement or uncertainty was discussed and verified by two additional researchers (AB and KM). A hand search of reference lists of included studies as well as papers recommended through personal communication were also examined for relevant studies. Studies were included in the review if they empirically measured treatment or management decision making as an anticipated or experienced outcome of being given or told one terminology versus another or others for a specific condition. Studies were excluded if they were reviews, editorials or commentaries or if they assessed participants less than 18 years of age making a decision for themselves (see online supplementary appendix 2). All studies that met the inclusion criteria were appraised for study quality by two authors (BN and TC) independently using two separate tools, one for quantitative studies and one for the qualitative study. The quantitative studies were appraised using a modified version of the Cochrane Collaboration’s tool for assessing risk of bias, which was developed by study authors (table 1). As the quantitative studies included in this review were not clinical trials, study authors adapted the Cochrane Collaboration’s tool for assessing risk of bias to appraise the studies for items relating to study design, study setting, study validity and analysis. Study validity included allocation of participants to different terminology, blinding of participants to the study hypotheses and reporting and measurement bias. The qualitative study was appraised using criteria adapted from the Consolidated Criteria for Reporting Qualitative Studies (COREQ) framework12 and results appear in online supplementary appendix 3. Two categories of study quality were identified by study authors according to each study’s methodological characteristics. In high-quality studies (lower risk of bias), the majority of criteria were fulfilled and done well, while in low-quality studies (higher risk of bias), the majority of criteria were not done or done poorly. Initial search results identified 1399 papers. After removal of duplicates and screening by title and abstract, 20 studies from the search and 1 study identified from reference lists underwent full-text reviews. Seven studies that reported the impact of different terminology for the same condition on treatment or management decision making were identified (figure 1). Three studies reported on DCIS,14–16 two on common childhood conditions (gastro-oesophageal reflux disease (GERD), conjunctivitis),17 18 one on polycystic ovary syndrome (PCOS)19 and one on a bony fracture.20 Six studies reported quantitative findings14 15 17–20 and one study reported qualitative findings.16 The key characteristics of these studies and their methods are summarised in table 2. All studies were hypothetical and involved various samples of community members who were not currently and/or previously diagnosed with the condition assessed. Of the six quantitative studies, five involved a randomised experimental design, with two using a paired sample design (cross-over) and three using an independent sample design (2×2 factorial). The qualitative study was linked to one of the quantitative studies,15 as women from the study were asked if they would be willing to participate in an additional qualitative interview for further investigation of the topic. Overall, the majority of studies were of higher quality with a lower risk of bias; however, one study did have a high risk of bias as the quality of reporting was low20 (table 3). Higher quality studies had defined study populations and settings, had low selection bias and described the data collection, methods and analysis appropriately. The qualitative study included in the review was rigorous and had appropriate methods to reach its research objectives. Researchers and the target population were defined, the sampling strategy was explained and data collection methods and data analysis were appropriate and well documented. Since the strength of the review is the diversity of included studies, results of the studies are summarised individually by study quality category, with data on management outcomes summarised in table 4. Following this is a narrative synthesis of the effect of terminology (more medicalised or precise terms vs less or non-medicalised terms) on management preferences (invasive management preference vs non-invasive management preference). Importantly for each study, we identify the classifications of management preferences and terminology and provide justification where applicable (see online supplementary appendix 4). This study on the influence of the term ‘PCOS’ found that when young women were given the term ‘PCOS’ in a hypothetical scenario of a doctor’s visit, they had significantly higher intention to have an ultrasound compared with women who were given the term ‘hormonal imbalance’ (mean=6.62 vs mean=5.76, F(1, 176)=4.63, p=0.033). The study also found that those who received the term ‘PCOS’ perceived their hypothetical condition to be more severe (17.7 vs 15.82, F(1, 176)=5.65, p=0.019) and had lower self-esteem compared with women who were not given the term ‘PCOS’ (25.86 vs 27.56, F(1, 176)=4.74, p=0.031). After women received information about the potential of PCOS overdiagnosis in a second scenario, both intention and perceived severity decreased, regardless of the term given (both p<0.001). The study also found a significant three-way interaction between the term ‘PCOS’, information about ultrasound reliability and overdiagnosis information (F(1, 176)=4.23, p=0.041), where that for those who did not receive the term ‘PCOS’, intention was significantly lower for those who received information about the unreliability of ultrasounds compared with those who received no information. For women who received the term ‘PCOS’, however, intention was high, even when told that the ultrasound was unreliable. This difference disappears after information about overdiagnosis is given in the second scenario, suggesting the provision of overdiagnosis information reduces the effect of the term. McCaffery and colleagues’ study on the impact of DCIS terminology on treatment preference (immediate treatment vs watchful waiting) and women’s level of concern found no significant differences in treatment preference between arm A (women who were given the term ‘abnormal cells’ first and then were given the term ‘preinvasive cancer cells’) and arm B (women who were given the term ‘preinvasive cancer cells’ first and then were given the term ‘abnormal cells’) with 33% and 40% of women respectively favouring treatment (p=0.23). However, 18% of women in arm A who were initially given the ‘abnormal cells’ terminology changed their preference to treatment when the terminology was switched to ‘preinvasive breast cancer cells’ while only 6% changed to watchful waiting (p=0.008). In contrast, there were no significant changes in treatment preference in arm B when the terminology was switched the other way (9% vs 8% changed their stated preference). Similarly, this study found that there was no significant difference between arms with regard to level of concern with 49% and 44% of women indicating that they would be extremely concerned p=0.600. However, when the alternative term was used, women in arm A (who were initially given the ‘abnormal cells’ term and then were given the term ‘preinvasive breast cancer cells’) were significantly more likely to report increased concern than women in arm B (67% vs 52%, p=0.001). This qualitative study investigated in-depth how different proposed terminologies to describe DCIS affected women’s treatment preferences and psychological outcomes by conducting semistructured interviews with women of varying education, cancer screening experience and with no history of a DCIS diagnosis. Findings demonstrated that overall women preferred a diagnosis of DCIS to be communicated using terminology that did not include the term cancer, as women generally exhibited stronger negative reactions when the cancer term was used to describe DCIS compared with when a non-cancer term was used. Although concern seemed to be high overall, women displayed a high level of interest in watchful waiting when it was described to them in a hypothetical scenario as a safe and effective option, and told that they could proceed to treatment in the future if necessary. This study also examined the impact of DCIS terminology on women’s treatment preferences by comparing three identical scenarios, with the only difference being the term used to described DCIS (‘non-invasive cancer’, ‘breast lesion’ and ‘abnormal cells’). Treatment options presented were surgery, medication and active surveillance. All participants saw all scenarios, with the order of scenarios varied across participants. When DCIS was described as a non-invasive cancer, 53% of participants preferred non-surgical options, whereas 66% chose non-surgical options when it was described as breast lesion and 69% chose non-surgical options when it was described as abnormal cells (p≤0.001). Although women with a previous history of cancer (other than breast cancer) and women with high socioeconomic status more frequently chose surgery in univariate analyses, high numeracy was the only independent predictor of preference for surgical treatment in the multiple variable logistic regression model for all three terms: cancer (OR 2.11, CI 1.34 to 3.34, p=0.001), lesion (OR 1.96, 1.20 to 3.19, p=0.001) and abnormal cells (OR 1.63, 1.01 to 2.67, p=0.048). The study also found a significant interaction between the term GERD and report of medicine ineffectiveness (F(1, 165)=4.52, p<0.05), as parents who received a GERD diagnosis were interested in medicating the infant, even if they were told that the medications are likely ineffective. By contrast, parents not given a diagnosis were interested in medication only when they were not given information about medication effectiveness, thus able to assume that the medications are effective. All parents in the study were also asked (using a 0–5 Likert scale with labelled end-points for each question) whether they were worried about their infant’s health (mean=2.28, SD=1.30), thought the condition was somewhat serious (mean=2.12, SD=1.19) and were relatively unlikely to describe their infant as being sick (mean=1.87, SD=1.45). These answers were not influenced, however, by the presence or absence of the term ‘GERD’ (all p>0.12). A similar study design conducted by Scherer and colleagues did not find an initial difference between the term ‘pink-eye’ and ‘eye infection’ on parents’ preference to medicate their infant. However, when symptoms were referred to as an ‘eye infection’, information about antibiotic ineffectiveness significantly reduced interest in using medication (F(1, 62)=14.67, p≤0.001). By contrast, when parents were told that the symptoms were ‘pink eye’, interest in antibiotics was not reduced by information about antibiotic ineffectiveness (F(1, 74)=0.93, p=0.33). Study authors also measured (using a 0–5 Likert scale with labelled end-points) parents’ perceptions about contagiousness and belief that their child could attend child care and found that parents who received the term ‘pink-eye’ thought that the symptoms were significantly more contagious (mean=4.04, SD=1.30) than parents who received the term ‘eye infection’ (mean=3.29, SD=1.63) (F(1, 137)=11.21, p=0.001). Parents who received the term ‘pink-eye’ were also less likely to believe that their child would be allowed to go to child care (mean=0.35, SD=0.90) than parents who received the term ‘eye infection’(mean=0.93, SD=1.13) (F(1, 141)=9.70, p=0.002). This study found that patients’ management expectations and perceptions of bony injuries differ based on the terminology used to describe the injury. Patients expected more invasive managements (operation or cast) when a more medicalised term was used to describe the injury compared with a less invasive treatment (sling or heals on own), with 58% of patients expecting invasive treatments for the term ‘broken bone’, 42% for ‘fracture’, 28% for ‘greenstick fracture’ and 26% for hairline fracture. In contrast, patients given the less medicalised term had a lower preference for invasive treatments, with 19% of patients choosing an invasive treatment for ‘crack in the bone’. This study also found that patients perceived the injury to be more severe when a more medicalised term was used to describe the injury (average mean severity score out of 10; broken bone=6.64, greenstick fracture=5.28, fracture=4.95, hairline fracture=3.58, crack in the bone=3.28). Table 5 summarises preferences for more invasive management option by type of terminology across the studies. Generally, there was a pattern in the same direction showing that when more medical or precise term was used, it resulted in a greater preference or interest in more invasive managements, whether this be intention to have an ultrasound for a PCOS diagnosis, surgical treatment for DCIS, increased interest in potentially ineffective medication or an operation or cast for a bony injury, although these differences did not always reach statistical significance. In contrast, when participants were given a less or non-medical/precise term, a higher proportion of participants chose a non-invasive management option. In this analysis, medicalised or precise terminology refers to language that describes the condition either using medical terms that healthcare professionals commonly used or that described the condition in a more specific way (when compared with the comparator term). Studies varied as some found a significant effect of terminology on management decision making while others found a significant interactions effect or within-person effect and psychological outcome effects (eg, perceived severity, level of concern). This is the first systematic review which synthesises the evidence on how different terminology given for the same condition impacts management preferences. Overall, the review demonstrates that different terminology used to describe the same condition can influence patient’s management preferences. Results indicate that when a more medical or more precise term was used to describe a condition, people tended to have stronger preferences for more invasive management options. Although not all of the studies included in our review had results which were statistically significant in relation to preferences for more invasive managements, at a population level, these trends may represent a clinically important difference. For example, a relatively small increase in the number of people preferring surgery in these studies could translate into significantly more surgeries across a larger population. The terminology given during a diagnosis to patients is important, as when a healthy individual becomes a patient, they can immediately become more vulnerable to the words their clinicians use.21 Using words that generate fear or anxiety cause patients to have more difficulty making informed decisions and becoming an active participant in their care.22 Different terms used to describe the same condition can have a direct influence on how patients understand their diagnosis and how threatening they perceive it to be.23 It has also been shown that the use of interpretive terminology (eg, including the words positive or negative or using a metaphor),24 25 the terminology used to describe a treatment choice,26 describing a condition with plain language terminology as compared with jargon27 and the severity of the characteristics of the diagnosis28 can have an influence on medical decision making. Furthermore, a recent survey of medical students found that students were more likely to classify condition synonyms as a ‘disease’ if the term used to describe it was medical.29 Together with findings from this review, these studies show that language is a powerful tool that has the potential to influence patients’ thoughts and actions. This study was limited by the small number of included studies in the review, which also included three studies that were conducted by members of the review team. However, in light of recent and ongoing evidence of overtreatment across a number of conditions and suggestions from leading global medical bodies to change the terminology of low-risk conditions,10 11 this review addressed an important and timely under-researched question. Due to the variability of the terms and outcomes assessed in the included studies, authors were unable to conduct a meta-analysis and pool the effects of the data, and therefore synthesised the results narratively. Since a quantitative synthesis of the data was not possible, findings may not be generalisable. Furthermore, the delineation between more medical/precise and less or non-medical/precise was challenging in some studies. For example, it seemed clear that ‘preinvasive breast cancer cells’ was a more medicalised term than ‘abnormal cells’. In contrast, it was not as clear what it was exactly about the term ‘pink eye’ (a more precise term to describe the condition) that elicited stronger parental preferences for antibiotics when compared with the term ‘eye infection’. Other aspects important to parents in this study (eg, aesthetical aspects) may have influenced management preferences. The author team therefore made explicit judgements about which terms were deemed more medicalised or precise and which were not, as well as what managements were considered invasive and what were considered non-invasive. These decisions were guided from the aims and outcomes of the studies, and followed categories used in the original studies, with the exception of the Azam paper where authors were guided by information on the precise medical terminology healthcare professionals use to describe a bony injury (including ‘broken bone’, ‘fracture’, ‘greenstick fracture’, ‘hairline fracture’) (see online supplementary appendix 4). We note the Azam paper was of lower quality, which made interpretations about the terms used more difficult. Nonetheless, it was very clear that in all of the studies, the use of different terminology for the same condition tended to elicit different responses to management preferences as well as psychosocial outcomes. Further research could usefully explore in more detail what characterises terms that elicit stronger preferences for more invasive managements. Importantly, all studies included in this review were hypothetical and were not presented to patients randomised to receive a diagnosis, and management preferences were assessed instead of actual management decision making. Patients facing real decisions may respond differently to those in the studies; however, it is likely that in real life situations, these effects may be even more pronounced. It is likely that patients would be more anxious than participants in current studies, therefore more susceptible to judgement biases that result from more medicalised terminology or labels. Against a backdrop of recent evidence of overdiagnosis and overtreatment across a number of conditions5 36–38 and the potential physical and psychological impacts this may have for the patient, understanding how different terminology given for the same medical condition may influence patients’ management preferences is important. This review suggests that the terminology used to describe a condition can influence patient preferences for management and related outcomes. Although further evidence is needed to help better understand precisely why some terms elicited stronger preferences for more invasive management, this review helps support the calls for changing the terminology of conditions where the risk of progression is low. Changing the terminology in low-risk conditions or conditions with indolent clinical course may be a potential communication strategy to help shift assumptions that immediate invasive treatments or tests are always needed, allow for better shared decision making between clinicians and patients and the consideration of more conservative management options. The authors would like the thank Phillippa Bourke for her help with the literature search and Dr Kevin McGeechan for his comments on the statistical aspects of the paper.
. Over-diagnosed: making people sick in the pursuit of health. Boston: Beacon Press, 2011.
; Presenting results and ‘Summary of findings’ tables — results without meta-analyses, 2011.
. On behalf of the U.S. Preventive Services Task Force. screening for prostate Cancer: U.S. Preventive Services Task Force recommendation statement. Ann Intern Med 2012;157:120–34. Contributors BN, AB and KM contributed to study concept and design. BN conducted the systematic literature search. BN and TC evaluated the eligibility of studies, performed the study quality assessment, extracted the data and conducted the evidence synthesis. BN, AB, TC, RM and KM interpreted the findings. BN drafted the manuscript and all authors critically reviewed and approved the manuscript. Funding This paper was written with support from the Wiser Healthcare CRE grant from the National Health and Medical Research Council (NHMRC) #1104136. BN was supported by the Sydney Catalyst Research Scholar Award. KM was supported by an NHMRC fellowship (1029241). The funders had no role in the design or conduct of the study; in the collection, analysis and interpretation of the data; or in the preparation or approval of the manuscript. Competing interests All authors have completed the ICMJE uniform disclosure form at www.icmje.org/coi_disclosure.pdf and declare: no support from any organisation for the submitted work; no financial relationships with any organisations that might have an interest in the submitted work in the previous three years; AB and RM are co-chairs of the steering group for the Preventing Overdiagnosis scientific conferences; no other relationships or activities that could appear to have influenced the submitted work.